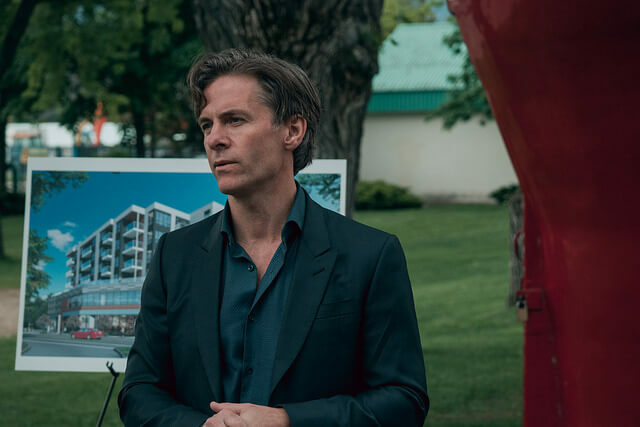 Kelowna’s latest development, The Shore, launched in May with not a single unit available for sale. 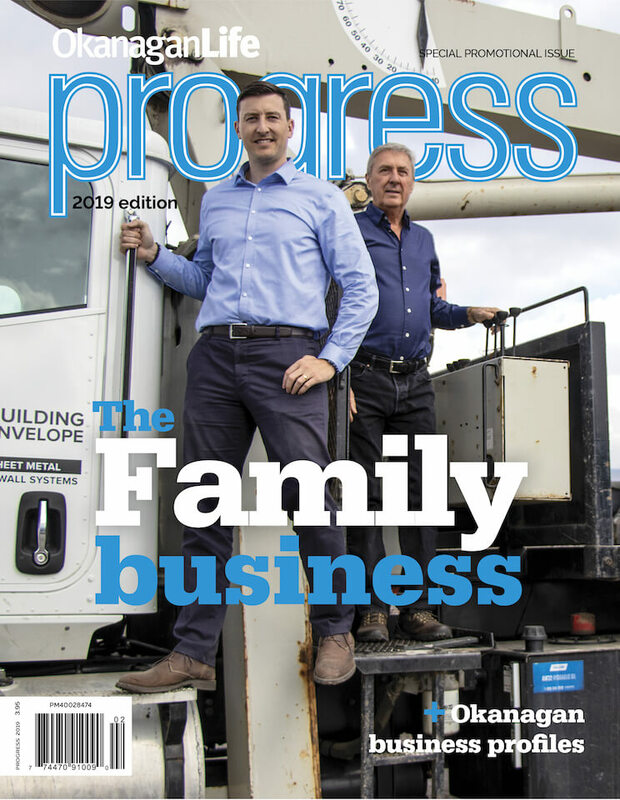 It’s not Kelowna’s hot real estate market affecting demand, but rather the unique combination of student and vacation rentals developer Rise Commercial Developments is bringing to a market in dire need of supply. The Shore will feature 103 modern residential suites, which will be available for student rental from September to May. Residents can gather on the large private amenity deck overlooking Okanagan Lake and enjoy the outdoor living space, which includes barbeques, fire pit and lounge area. On the ground floor, shops, cafes and restaurants surround an expansive public courtyard in the centre of the site. Confirmed tenants include Good Earth Café, Shoreline micro-brewery/restaurant, and kb&co Casual Conscious Eats restaurant. 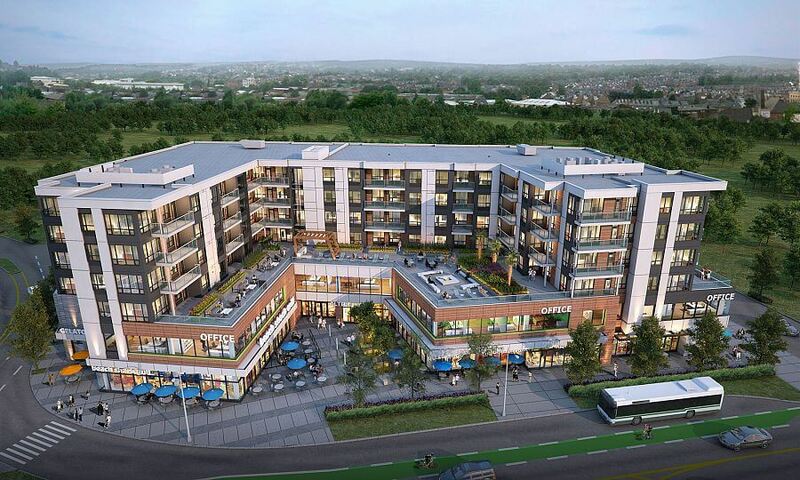 The first apartments will be available in time for the 2019 school year. Currently, Kelowna has a vacancy rate of less than one per cent. The recent Canadian Mortgage and Housing Corporation report pegged the vacancy rate at only 0.2 per cent, the lowest in the country. On-site for the launch was Okanagan College (OC) Student Union elected board representative Jennifer Meyer and Kelowna organizer Courtney Kindlein. Photo: Kelowna City Councillor Gail Given, developer Greg Applet and OC Student Union rep Jennifer Meyer lift paddles rather than shovels at the Shore's groundbreaking. 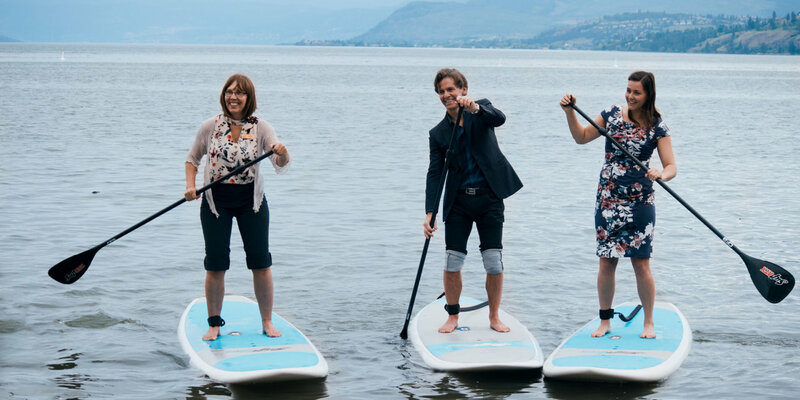 In a ceremonial groundbreaking, Appelt, Meyers and City of Kelowna Kelowna City Councillor Gail Given headed out on the water at Gyro Beach. 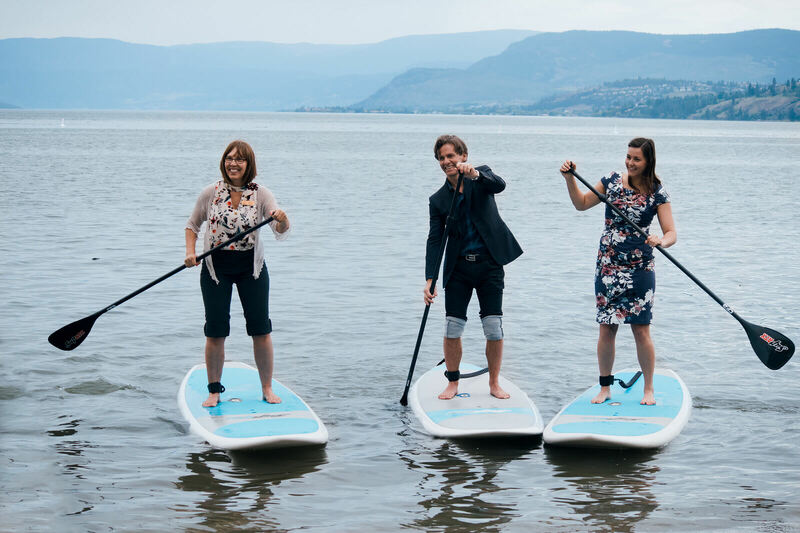 Balancing on paddleboards, the raised their paddles, broke the surface of Okanagan Lake, and then padded back to the shore. “What better way to launch The Shore than on the shores of one of Kelowna’s most popular and stunning beaches,” says Applet. Okanagan Beach Rentals, whose outlet is located at Gyro Beach, provided paddleboards. The office component, which extends 20,000 sq. ft. on the second floor, is 100 per cent leased by HM Commercial Group. Only a few retail spaces are still available. The Shore building extends six storeys over 150,000 sq. ft. along its irregular lot shape, creating a sweeping curve leading into South Pandosy urban centre. The finish of the building is dominated by a modern combination of concrete, metal panel and wood treatments, with a significant amount of glazing. Glass and aluminium railings trim the private decks and balconies, separated by wood partitions. The Shore is located at 3461 Lakeshore Road and on the web at theshorekelowna.com.